"As you know, there wasn't none of us. But ... 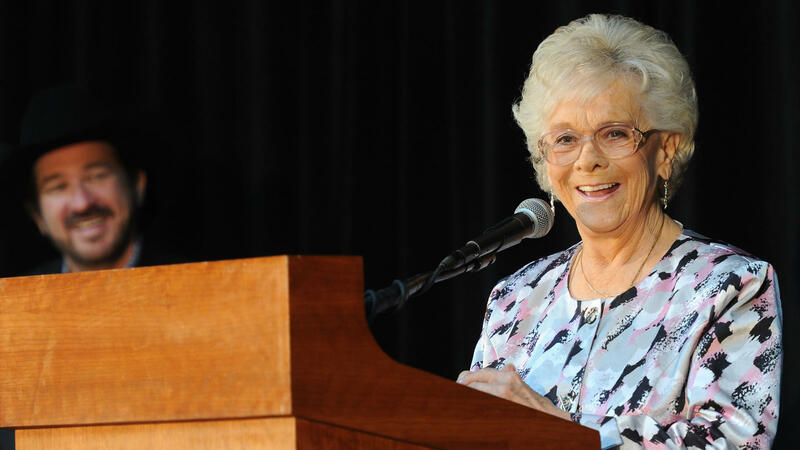 I hung in there like a hair on a grilled cheese," Jean Shepard said when she was inducted to the Country Music Hall of Fame in 2011. Shepard was invited to join the Grand Ole Opry in 1955, and she performed there until last year. But she didn't get voted into the Country Music Hall of Fame until 2011, and many saw the honor as overdue. At the award ceremony, she spoke about the start of her career as a woman in country music. "As you know, there wasn't none of us," she said. "But I was happy to do my part. I hung in there like a hair on a grilled cheese." One of the first women to find success as a solo act in country music has died. Jean Shepard was a singer with a sharp wit who built a career in a genre dominated by men. Blake Farmer of member station WPLN has this appreciation. BLAKE FARMER, BYLINE: When Jean Shepard was driving from town to town playing honky tonk bars, there were only a couple of women putting out music by themselves - Kitty Wells and Minnie Pearl. More often, the women in country music were performing with their husbands or referred to as girl singers with a band. So Shepard stood out and even sounded defiant. JEAN SHEPARD: (Singing) So girls, take my advice, think it over once or twice for the root of all evil is a man. FARMER: When she started out, Shepard said she struggled to get a record deal because of her gender. But she joked about the discrimination, as in this 1983 interview on TNN. SHEPARD: I don't like to hear a woman say, well, I can do anything a man can do. My husband can lift 200 pounds of horse feed, and I can't do that (laughter). FARMER: Shepard helped pave the way for Loretta Lynn and Tammy Wynette. And she had her own top 10 hits, most of them about love from a woman's point of view. SHEPARD: (Singing) You gaze at that guitar on your knee in a way that you never look at me. This love affair of yours has gone too far, and I'm tired of playing second fiddle to an old guitar. FARMER: Shepard was invited to join the Grand Ole Opry in 1955 and performed there until last year, but she didn't get voted into the Country Music Hall of Fame until 2011, which many saw as overdue. Here she is at the ceremony. SHEPARD: I want to talk a little bit about the early years as far as a female in country music. As you know, there wasn't none of us. But I was happy to do my part. I hung in there like a hair on a grilled cheese. FARMER: Jean Shepard's closest friends say there was nothing phony about her. She died outside of Nashville on Sunday. She was 82 years old. For NPR News, I'm Blake Farmer. SHEPARD: (Singing) You know that you kill my love, and maybe that's a crime. I'll go where I can get twice the lovin' baby... Transcript provided by NPR, Copyright NPR.